That’s according to an advance copy of “Team of Vipers,” an upcoming insider’s account of the Trump administration by former White House aide Cliff Sims obtained by New York Magazine. According to the magazine’s summary of the passage, Trump offered NASA the money on April 24, 2017, moments prior to a call to the International Space Station arranged so that the mercurial president could congratulate astronaut Peggy Whitson for breaking the existing record for the American who had spent the longest period in space. As Trump was being briefed by Sims and other officials, including acting NASA administrator Robert Lightfoot Jr., according to the account, his attention began to wander, and he suddenly addressed Lightfoot. 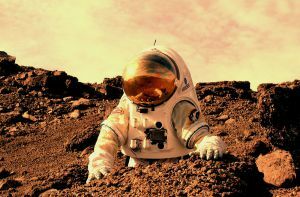 “What’s our plan for Mars?” he asked. Lightfoot reportedly tried to “let Trump down easily,” explaining the extraordinary amount of preparation that a mission to the Red Planet would require — and that NASA’s timetable for a human flight to Mars tentatively called for a mission in the 2030s. “Trump bristled,” according to New York‘s account of the passage — and, characteristically, he offered Lightfoot a deal: unlimited funding for a vastly shortened timeline. Lightfoot apologized, but said he didn’t think it was possible, leaving Trump “visibly disappointed,” according to the account. But a few minutes later, Sims wrote, Trump perked back up as he addressed himself in a mirror while preparing for the call.